An artist's rendering of Kepler 22B, a planet that circles within a habitable zone of a sun-like star. The planet-hunting space telescope known as Kepler has found some crazy worlds since its launch in 2009: a planet with the density of Styrofoam; a solar system with five Neptune-sized worlds zipping around their star in close formation; a planet orbiting two stars at once, like Luke Skywalker's home world Tattooine. All of that is really just a sideshow, however, to the space probe's true mission: scouring the heavens for Sun-like stars that have Earth-like planets circling in the so-called habitable zone  the region where the fires from the home star would provide just enough heat to incubate life, but not so much that they'd cook the planet like a roasted nut. So far, Kepler hasn't found any of these so-called Goldilocks worlds (not-too-hot, not-too-cold) but that's no surprise. Astronomers knew from the start that a Mirror Earth would be tough to spot, and figured it would take several years to nab even a single one. But they're getting awfully close. Speaking at a press conference at the NASA Ames Research Center, near Mountain View, California, Kepler's home base, astronomers announced this week that they'd found a brand-new planet, somewhat bigger than Earth, orbiting a Sun-like star about 600 light-years from Earth. The world now known as Kepler 22b is, said mission chief scientist, Bill Borucki, "Kepler's first habitable-zone planet around a Sun-like star." If the planet has an atmosphere, he said  hardly an unreasonable assumption  "the surface temperature would be an average of 72 degrees Fahrenheit (22 C)." This, of course, means that water would neither freeze solid nor boil away, and since water is an essential ingredient for any form of life we understand, that makes Kepler 22b a plausible place to look for biology  with a couple of major caveats. First, while the new planet has just 2.4 times the diameter of Earth, it has nearly 14 times the volume. If it's made of rock, like our own planet, it's awfully massive and has awfully powerful gravity. It might not be made of rock, however: in our own Solar System, the next-biggest world up from Earth is Neptune, with four times Earth's diameter. But while Neptune is thought to have a rocky core, most of the planet's bulk is made up of water and gas. 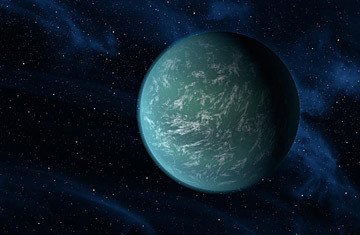 Since Kepler 22b intermediate in size between the two, it is equally likely to be a mirror of either Neptune or Earth. In fact, a planet known as GJ 1214b, found with ground-based telescopes in 2009 is about the same size as Kepler 22b, and it's almost certainly a mini-Neptune, but much hotter. (The reason for that is that its star isn't at all Sun-like; GJ 1214b orbits very close to an M-dwarf, which is significantly smaller, redder and dimmer than our Sun). That doesn't mean Kepler 22b isn't rocky. It just means planetary scientists haven't figured out whether there's a sharp dividing line between big Earths and small Neptunes, or whether you might have planets of exactly the same size but totally different compositions. The question of where Kepler 22b falls would be a lot easier if astronomers could measure its mass; combine that with size and you get density, which reveals what the planet is made of. But the Kepler telescope is designed to measure size alone, by noting how much a star's light dims when a planet passes in front of it. Ground-based astronomers can measure a planet's mass, by seeing how much its gravity makes the star wobble. The problem is, you can do that easily only with bright stars, and the new world's parent star is so far away it just isn't that bright. Next summer, Kepler scientists will use the giant Keck telescope in Hawaii to try to get a fix on the planet's mass, but it's not certain that even the mighty Keck can pull that off. If Kepler 22b does turn out to be a small defrosted Neptune, that does not rule out life. Since Earth is the only example we know of to date of an inhabited planet, it would be foolish to make any generalizations. For all we know, astronomers on Kepler 22b are shaking their heads in doubt over whether a little, rocky planet like ours, with only 70% of its surface covered in shallow oceans, could possibly harbor life. Just in case Keplerians are indeed looking back at us as we look out at them, astronomers with the Search for Extraterrestrial Intelligence (SETI) program, who scan the skies for possible signals from alien worlds, are planning to turn their radio dishes in Kepler 22b's direction. Last summer the institute's Allen Telescope Array, in Hat Creek, California, went into hibernation when its funding dried up. Thanks to lots of new contributions, though, the array is now up and running again. And thanks to Kepler and other planet-hunting missions, it can now point at stars that are known to harbor planets rather than just choosing randomly, as it did for decades. Kepler itself, meanwhile, keeps chugging along. Joining Kepler 22b, is a list of 1,094 brand-new planet candidates found so far by the satellite, raising the grand total of probable exoplanets to a staggering 2,326. Most haven't been confirmed yet, but the team figures at least 90% are really out there. Of that number, 48 are in their stars' habitable zones, and five of these are smaller than Kepler 22b  no more than two times the size of Earth (the catch is that none of those orbits a Sun-like star). While Kepler hasn't found a true Mirror Earth yet, the sheer number of likely worlds out there makes that only a matter of time. The question is whether NASA will provide it. The mission was originally approved to run for 3½ years, but it turns out the measurements are tougher to take than the scientists originally hoped. To be sure of finishing the job, they need another few years  a so-called extended mission  and for that to happen, NASA has to pony up more money. "We've put together what we believe is a compelling case," said Borucki. Come February, he'll find out if NASA agrees.